I’m sure you’ll find ignorantly strict Macallan-ites who would say that it isn’t The Macallan unless it is born of a sherry cask. Don’t get me wrong. I love The Macallan. I am heartily fond of almost any bottling that my inquisitive lips might sip from what many have called the “Rolls Royce” distillery of Scotland. But it wasn’t until 2004 that The Macallan realized that it could still be “The Macallan” while utilizing casks other than the sherry casks of Jerez, Spain. Perhaps you could think of it this way. I am Lutheran, and even more so, what we would call a “confessional” Lutheran. I believe the Holy Scriptures to be the sole source for faith and practice and I confess the Lutheran Confessions as the norma normata. I fully subscribe to the historic liturgy and the rites and ceremonies therein as they have been delivered from the church of all ages as the best and most glorious forms. In all of this, I practice what I preach. Feel free to stop by and see. That being said, my beloved synod’s hymnal holds Methodist hymns and has for a good long time. Some of these hymns are even so well beloved by Lutherans who may not know any different. In fact, I’d be willing to wager that if you discovered a retorting Lutheran at a Methodist funeral singing “Love Divine, All Loves Excelling,” you may very well hear them say upon departure, “Well, at least they sent ol’ Bob off to his committal with a good, German Lutheran hymn.” Except, they’d be foolishly wrong. The hymn is Wesleyan. The point is, even though Wesley was not a “Lutheran,” he did offer theological musings that rendered themselves useful to the church as a whole–and the Lutheran Church in particular is better served because there indeed exists in our midst those who actually take great care and use theological precision to take from the universal church what is good, right, and salutary — and then leave the rest. I offer this analogy in relation to The Macallan. So again, as I began, I’m sure you’ll find ignorantly strict Macallan-ites who would say that it isn’t The Macallan unless it is born of a sherry cask. But then I’d be willing to wager that if you allowed them a blind taste test of the 17 year old Fine Oak, which was aged in a white oak bourbon cask, they’d probably sniff, sip, smile, and say, “I love it! What is it? It must be a fine little bit of The Macallan!” And they’d be right–and yet so terribly wrong. Yes, it is a fine, orthodox edition of The Macallan. But it’s born of something foreign to The Macallan’s distinct tradition. 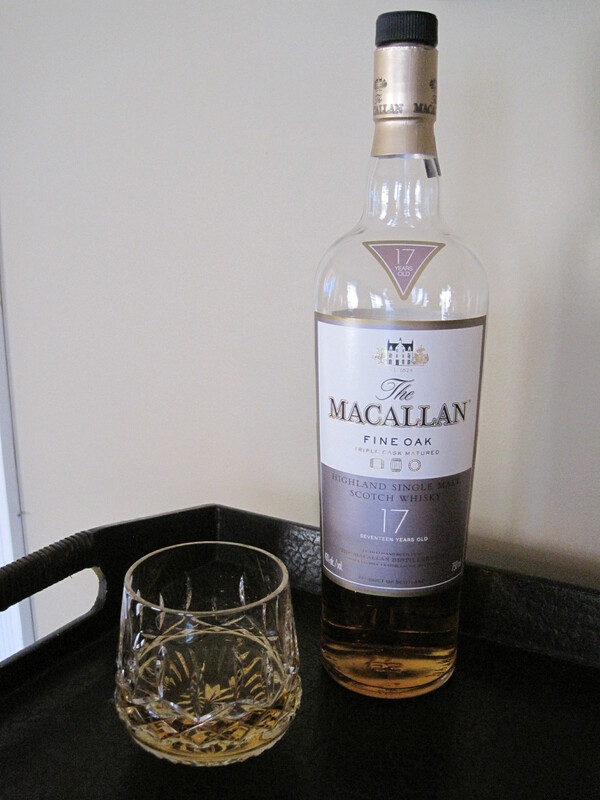 So without getting too philosophical, I’d simply offer that The Macallan, in her orthodoxy, has ventured to discover and serve with the 17 year old Fine Oak what is good amongst the bourbon casks and to leave the rest. This particular edition smells very sweet, almost like chocolate chip cookie batter with a little too much vanilla – but not so much that it’s bothersome. The palate receives what the nose suggests, namely, a whisky that is sweet and smooth and gentle, with hints of chocolate. The finish is equally as gentle, leaving only a slight but pleasant aftertaste of nuttiness. Perhaps the only appropriate German Lutheran hymn to sing after savoring such a wonderful edition would be “Sing my tongue the glorious battle, sing the ending of the fray…” But then again… that’s not a Lutheran hymn. The tune is that of a French carol uplifting a text by Venantius Honorius Fortunatus, the venerated Roman Catholic hymnographer of the Middle Ages. Darnit! Isn’t there anything truly Lutheran in the Lutheran Church, or could it really be as the Creeds declare — just the one holy catholic and apostolic church?